A Very Fine French 18th Century Oil on Canvas "Fecundity" After Francois Lemoyne (French, 1688-1737) Depicting a young mother holding her twin her infant babies on her arms, within an ornate gilt wood carved and gesso frame. Spuriously inscribed: Boucher (l/r). Circa: 1800. In 1729 François Lemoyne was commissioned to paint a huge chimney piece-decoration for the Salon de Paix at Versailles in an attempt to depict King Louis XV Giving Peace to Europe. In this allegorical painting, Louis XV hands an olive branch, the symbol of peace, to a smiling Europe. Behind them we see the Temple of Janus with its doors firmly closed, despite the efforts of Discord, who tries to force them open. Minerva, seated on a cloud at the top right of the composition, gestures to Mercury, who symbolizes Commerce, to ensure that Discord is prevented from upsetting the new-found peace. At the bottom right of the painting, a female figure symbolizing Piety, with a divine flame burning in her head, offers the two infants, held by Fecundity, to Europe. 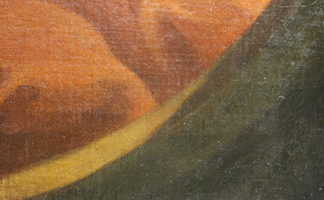 The present painting appears to be a reduced replica of the original. 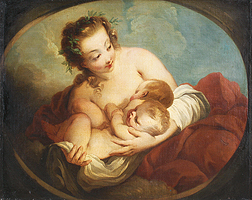 Lemoyne's depiction follows an age-old tradition, traced by Cesare Ripa to ancient medals, of depicting Fecundity as 'a matron of pleasant countenance' holding infants. 'The attitude of caressing two children' Ripa observed, 'expresses one of the greatest consolations of the married state, and indicates the happiness and delight that mankind enjoy in rearing their beloved offspring'. Lemoyne ingeniously adapted the image into his chimney piece allegory to symbolize the continuity and growth of the French line; indeed, several eighteenth-century authors saw in the protective maternal figure and young infants a reference to Louise-Elizabeth and Anne-Henriette, Louis XV's eldest children, born 14 August 1727. Though we do not have any records of the provenance of this painting, a similar painting by Lemoyne, described as 'une belle et gracieuse etude finie', was owned by the eighteenth-century collector La Live de Jully. In his catalogue raisonné of Lemoyne's works, Prof. Jean-Luc Bordeaux (op.cit., 1984, p. 115) describes this subject painting as 'finished first idea' for the figural group in the Versailles composition. 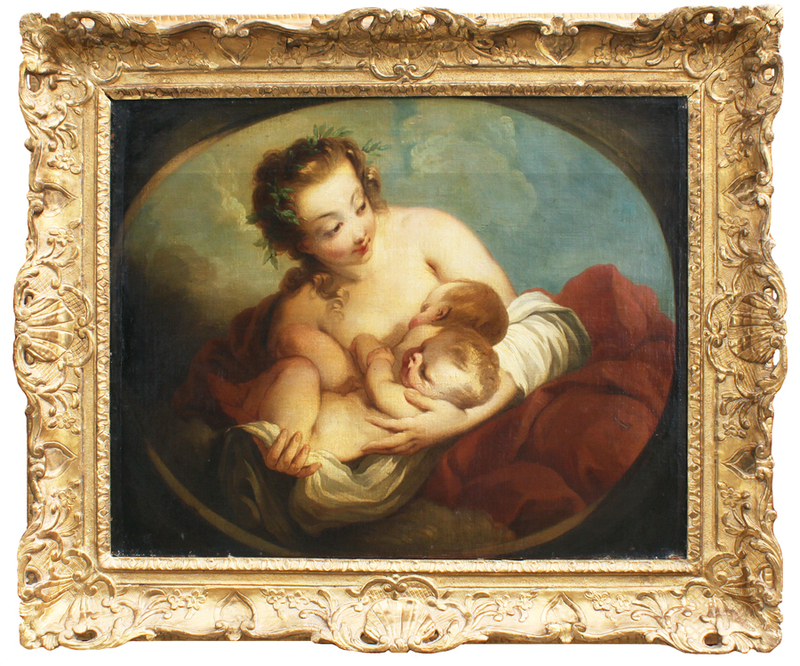 A Very Fine French 18th Century Oil on Canvas "Fecundity" After Francois Lemoyne (French, 1688-1737) Depicting a young mother holding her twin her infant babies on her arms, within an ornate gilt wood carved and gesso frame. 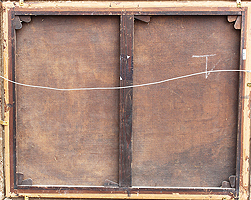 Spuriously inscribed: Boucher (l/r). Circa: 1800. In 1729 François Lemoyne was commissioned to paint a huge chimneypiece-decoration for the Salon de Paix at Versailles in an attempt to depict King Louis XV Giving Peace to Europe. In this allegorical painting, Louis XV hands an olive branch, the symbol of peace, to a smiling Europe. Behind them we see the Temple of Janus with its doors firmly closed, despite the efforts of Discord, who tries to force them open. Minerva, seated on a cloud at the top right of the composition, gestures to Mercury, who symbolizes Commerce, to ensure that Discord is prevented from upsetting the new-found peace. At the bottom right of the painting, a female figure symbolizing Piety, with a divine flame burning in her head, offers the two infants, held by Fecundity, to Europe. The present painting appears to be a reduced replica of the original. 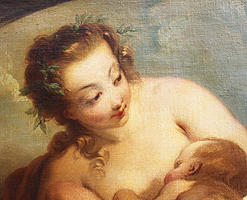 Lemoyne's depiction follows an age-old tradition, traced by Cesare Ripa to ancient medals, of depicting Fecundity as 'a matron of pleasant countenance' holding infants. 'The attitude of caressing two children' Ripa observed, 'expresses one of the greatest consolations of the married state, and indicates the happiness and delight that mankind enjoy in rearing their beloved offspring'. Lemoyne ingeniously adapted the image into his chimneypiece allegory to symbolize the continuity and growth of the French line; indeed, several eighteenth-century authors saw in the protective maternal figure and young infants a reference to Louise-Elizabeth and Anne-Henriette, Louis XV's eldest children, born 14 August 1727. Though we do not have any records of the provenance of this painting, a similar painting by Lemoyne, described as 'une belle et gracieuse etude finie', was owned by the eighteenth-century collector La Live de Jully. In his catalogue raisonné of Lemoyne's works, Prof. Jean-Luc Bordeaux (op.cit., 1984, p. 115) describes this subject painting as 'finished first idea' for the figural group in the Versailles composition.